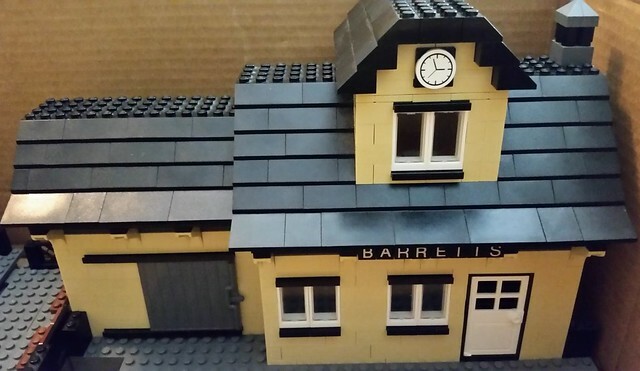 The model seen here is originally based upon the Brick City Depot "Winter Village Train Station", which can be seen here. I recently (2018) updated windows and doors to be white to give better contrast to the other chosen colors, and I extended the platform clock away from the wall and double-sided it so both ends of the station can see it. 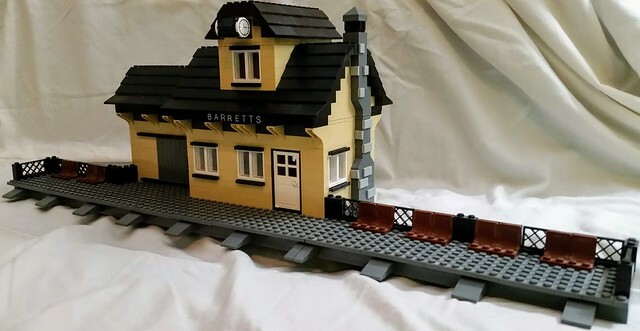 This station was built in 1901 in Barretts, Missouri for use by Brick Railway Systems. It stands on the old Pacific Railway of Missouri right-of-way, which first ran through the area in the mid-1850's. The station is a wooden structure with a stone fireplace, indoor waiting area, and a freight storage room that was added to the station in 1928. The upper floor is for the telegraph operator, which as of 1977 the telegraph has been replaced with a computer for the dispatcher to locate any train in his sector at any time using advanced software. Here is the street side, with the date the depot was built proudly displayed. 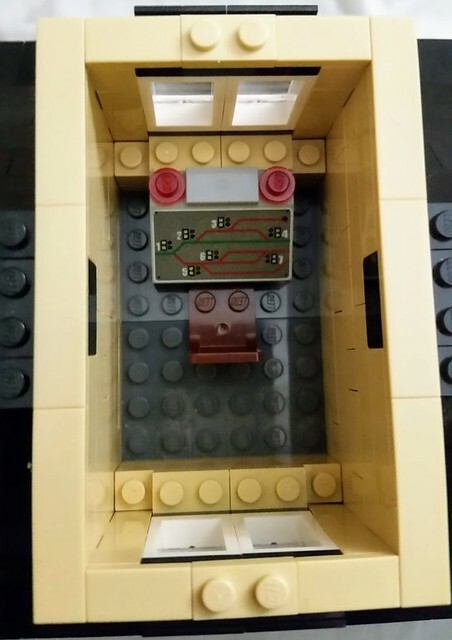 Here is the modular side of things: One left and one right platform, the station proper, the control room and it's roof are all connected by either pins or a very few studs. As usual, comments questions, and complaints are always welcome! EDITED 2/20/17: Updated the screenshots into real-life pictures. EDITED 7/24/18: Updated the model's real-world pictures and associated text. I really feel you've gutted any life out of this building, The original building had charm with the rough style brick facade and snow on the roof, yours is flat and lifeless, and loses the more attractive sloping style of the roof. And how do you get to the second floor? Maybe try adding some window sills and subtle ornamentation to reinforce the corners of the building. Some lamp posts and foliage would help across the platform. The inset upper level also does not match the style of the rest of the building, it may look better as a traditional dormer. 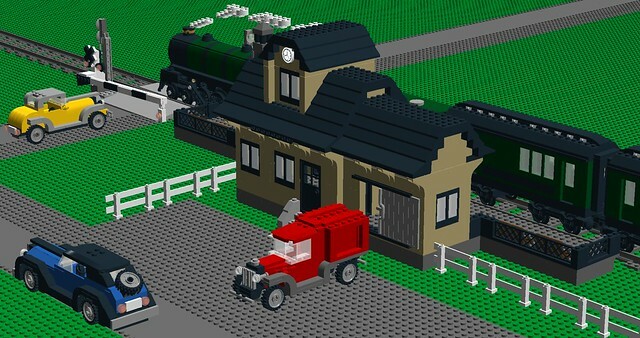 I ordered the station's last bit of parts yesterday, and to celebrate I am uploading this slightly older picture of the station with a bunch of 1920's car and my Emerald Express passenger train. The station as it is in the picture isn't up to date with what I'm building, but the changes are relatively minor aesthetic ones to the roof. 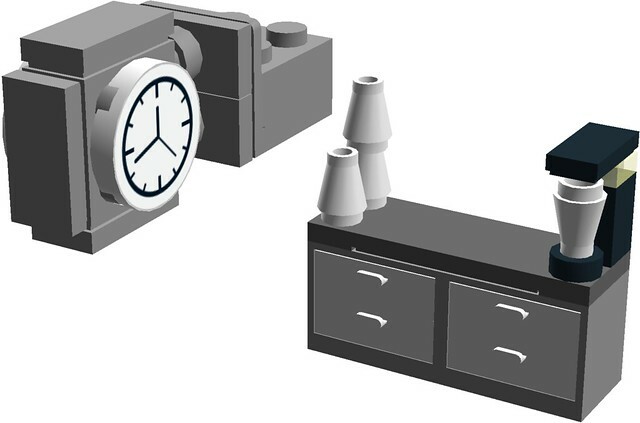 You can see the final version of the station (and get the LDD file for it) by itself in the main post above. Looking good! I really like it, lots of room available! Thank you! I just updated the screenshots into real-life pictures in the first post. What do you guys think? I think it would look very nice in a rural layout, as i guess is intended. Only thing bugging me is the missing Stairs / Ladder to the second floor. That's like the modern lego trains without doors, in kind of breaks the immersion. I guess the double-seats (which cannot be used) are meant as benches? 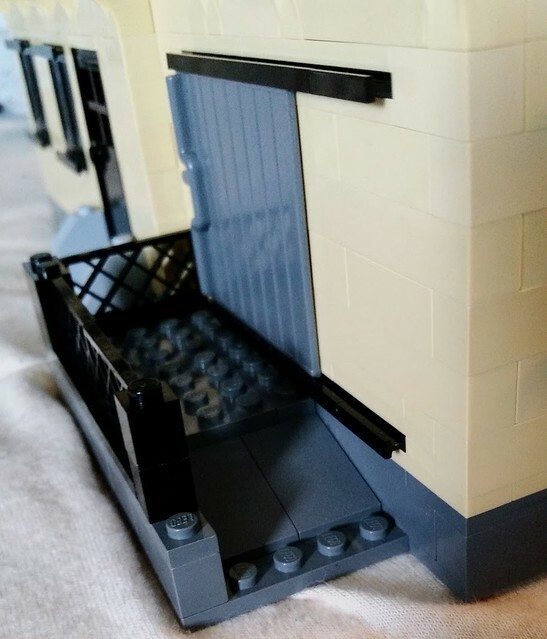 Maybe you could use some brick-built benches that offer some more detail for the station and are more compatible with the minifig anatomy? Thank you for liking the model! The lack of stairs is intentional, as regular CITY sets don't have them, and i'm going for an semi-official vibe with my town. Also, the double seats are in fact benches, but they can be used for one figure only on each bench... brick built benches are an option, but they can't be much bigger as their is very limited space. I also added a ramp to the freight depot's street side, for ADA (American's with Disabilities Act) compliance. This way your figures can roll up the ramp, through the big door and into the waiting room right next door. Plus loading freight is much easier now! I have managed to use the leftover white / trans-clear windows from my conversion of Benny's space-ship shop to make the old Barretts railroad depot a little more colorful. I am also going to add a coffee machine to the upper floor for the employees and a stuck-out clock to the tower roof so the passengers at platform level can see it easier at some point in the relative near future. I like the lay-out of this small station, but it's still a bit rough. 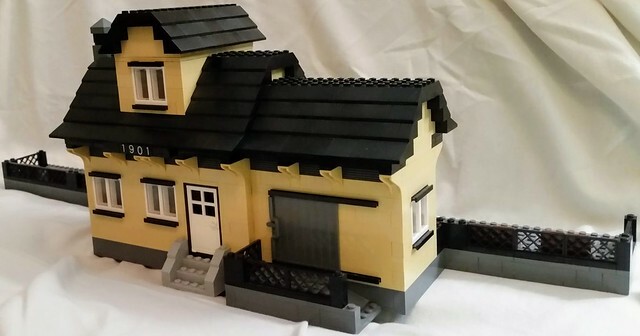 I am by no means a good MOC'er, but I would add tiles (1x1, 1x2 and 2x2) to make a pattern on the inside of the building and to smoothen things out on the outside (you could use 1x1 round tiles or the commonly used 2x2). Add some plants and garbage cans (in and out) and instead of using slopes to connect the platform to the track, I would close the front and add some ladders to give railway personnel acces to the track. 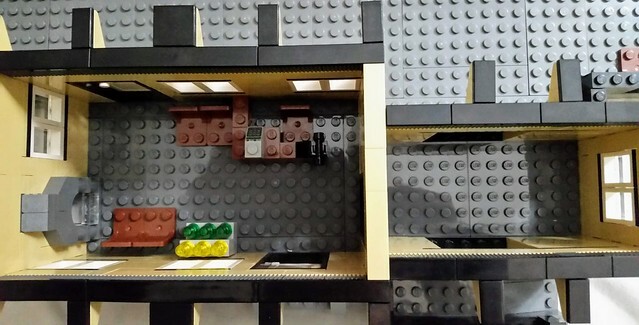 Found the last few parts without making another Brick-Link order (green trash can and coffee bar will have to wait for another day) and took the pictures needed to remake the first post. Please take a look up there if you don't mind, and if you have any questions, suggestions, or complaints please don't hesitate to comment!